MEETING DATE AND LOCATION CHANGE FOR PUBLIC HEARING (VA14-0001)Notice is hereby given that the Board of County Commissioners public hearing for VA14-0001 has been rescheduled to March 25, 2014, at 5:05 p.m., at the Hendry County Courthouse, Commission Chambers, 25 E. Hickpochee Ave, LaBelle, Florida. The recommendations of the Local Planning Agency will be made to the Board of County Commissioners for nal consideration at this public hearing. Copies of the les and information regarding the petition are available for public inspection at the Hendry County Planning and Zoning Department, 640 South Main Street, LaBelle, Florida, and may be viewed Monday through Friday from 8:00 a.m. to 5:00 p.m. All persons wishing to be heard on this issue may appear at said meeting. If a person decides to appeal any decision made by the board, agency, or commission with respect to any matter considered at such meeting or hearing, he or she will need a record of the proceedings, and that, for such purpose, he or she may need to ensure that a verbatim record of the proceedings is made, which record includes the testimony and evidence upon which the appeal is to be based. Any questions pertaining to this matter should be directed to the Planning and Zoning Department, either by phone (863-675-5240), email (scatala@hendrya.net), U. S. mail (P. O. Box 2340, LaBelle, FL 33975) or by fax (863674-4194). Si necesita la assistencia de un interprete que hable espanol para participar un esta reunion, por favor pongase en contacto con Myra Johnson al (863) 675-5240. Petition Number: VA14-0001 Applicant/Agent: Ms. Barbara Maves, represented by Ensite, Inc. Resolution Title: A RESOLUTION OF THE BOARD OF COUNTY COMMISSIONERS OF HENDRY COUNTY, FLORIDA, GRANTING A VARIANCE OF 115 FEET RESULTING IN A LOT DEPTH OF 35 FEET, 7 FEET RESULTING IN A FRONT SETBACK OF 28 FEET, 4 FEET RESULTING IN A SIDE SETBACK OF 11 FEET, AND 24 FEET RESULTING IN A REAR SETBACK OF FOOT TO ESTABLISH A LEGAL, NON-CONFORMING STATUS FOR THE PROPERTY AND TO ALLOW FOR SITE IMPROVEMENTS IN THE IN THE MEDIUM DENSITY RESIDENTIAL (RG-2) ZONING DISTRICT Location: 861 CR 78, LaBelle, FL Property size: 0.48 acres +/Request: The applicant is requesting a variance of 115 feet resulting in a lot depth of 35 feet, 7 feet resulting in a front setback of 28 feet, 4 feet resulting in a side setback of 11 feet, and 24 feet resulting in a rear setback of foot, to establish a legal non-conforming status and to allow for site improvements on the property. Legal description of subject property: Karson Turner, Chairman Hendry County Board of County Commissioners 7 Caloosa Belle March 13, 2014 Submitted photoFuture farmersThese beautiful red cabbages were recently harvested from LaBelle Elementary Schools Garden Club garden. Eighteen students from grades 3 and 4 started the vegetable garden in October of 2013 under the direction of Ms. Strickland, the Art teacher at L.E.S. Other vegetables planted were tomatoes, jalapeno peppers, and Japanese eggplants. The garden club is all about soil, bugs, how to plant and care for plants and how to be a good environmentalist. The students in the picture are from left: Fabian Sanchez, Isaac Polanco, Colton Bass, Evan Martin and Max Lofton. Submitted photoThanks for the MemoriesThe Firehouse Community Theatre proudly presents this years musical production, Thanks for the Memories, written and directed by Firehouses very own Nick Fidanza. Nick and the Firehouse Singers are ready again to entertain us with a USO look at World War II. The USO mission supported the troops during each of these wars. Celebrities like Bob Hope rallied many singers, actors and comedians to follow him into the war zones to entertain our troops. The Firehouse Singers will be presenting several of these famous memories and help recapture some of our fondest memories from the greatest generation. Showtimes are Friday March 21st and Saturday March 22nd at 7:00 p.m. and Sunday, March 23, at 2 p.m., as well as the following weekend, Friday, March 28, and Saturday, March 29, at 7 p.m. and Sunday, March 30, at 2 p.m. Tickets for all of our productions can be purchased on our website www. rehousecommnitytheatre.com and are $12.00 in advance, or use the ticket hotline at (863) 675-3066. Tickets sold the night of the performance are $14.00, however, we cannot guarantee a seat if we are sold out. The Firehouse Community Theatres annual musical is always one of the most popular productions, so make sure to get your tickets now! The Firehouse Community Theatre is located at 241 North Bridge Street in historic downtown LaBelle; three blocks north from the intersection of SR80 and SR29 and just 28 minutes from exit 141 on I-75. For more information on the Firehouse Community Theatre, please visit their website: www. rehousecommunitytheatre.com or call the Ticket Hotline at (863) 675-3066. Mailing address: Firehouse Community Theatre, P.O. Box 958, LaBelle, FL 33975. 12 Convenient Locations including: 870 W Hickpochee Ave. #1400, LaBelle, FL863.674.0460Our team of board certied doctors treat every eye care need, locally.www.ecof.com 8 Caloosa Belle March 13, 2014 Lots of action at the LaBelle Youth Swine Show On Wednesday, February 12th, the 4-H/ FFA Market Swine Show was held. The show consisted of 4-Hers and FFA members exhibiting their market swine ranging from 200 pounds to 299 pounds. The show was sponsored by Diamond R Fertilizer. The of cial judge of the evening was Mr. Rick Ahrens of Brooksville, Florida. The hogs were judged on muscling, trimness, length of body, spring to the rib, design, productive type, correctness of nish, and expected carcass desirability. Receiving blue ribbons for their entry: Ryley Bowen, Travis Burchard, Trace Burchard, Bryana Campbell, Clay Campbell, Brilee Cochran, Cutter Cochran, Dustin Cooper, Ethan Cox, Clayton Cox, Trey Crews, Kirsi Dunaway, Evan Farless, Brandon Flack, Tyler Flack, Shelby French, Dalton George, Wyatt Glenn, Gage Grif n, Emilee Harrell, Case Hendry, Ashlyn Hood, Alyssa Jedrykowski, Amanda Jedrykowski, Cameron Kelly, Emmalee Langford, Joey Leon, Taylor Lynn, Taylor Martin, Tayler McGill, Madison Murrah, Lane Murray, Shelby OBannon, Haylee OBannon, Alisah Obern, Miranda Pequeno, Marshall Platt, Dillon Powell, Jaden Razo, Christopher Rigdon, Edicia Rodriguez, Edilia Rodriguez, Derik Rose, Katie Rose, Logan Sanders, Kaydence Tindall, Kenzie Tindall, Trevor Vahle, Dalton Watson, Tatianna White, Jordan Whobrey and Cassidy Willis. Receiving red ribbons for their entry: Gwen Ash, Taylor Corbitt, Austin Dailey, Augustus Dunaway, Daniel George, Lauren Glenn, Landon Glenn, Alyssa Harrell, Kayla Hood, MacKenzie Hudson, Emily Markussen, Tristan Mudge, Dillon White and Emma Willis. The Grand Champion Swine was shown by Brilee Cochran of the Pig Skin Classic 4-H Club. Brilees hog weighed 289 pounds and was purchased by H & H Harvesting. Taylor Martin of the Double H Livestock 4-H Club exhibited the Reserve Champion Hog weighing in at 299 pounds. Palmer Ranch purchased Taylors hog. After the placing of the swine came the Showmanship category. Showmanship is judged on the ability to exhibit an animal to its best advantage, as well as the overall care and training of the animal. The exhibitors are judged on control, presentation to the judge, awareness of the judge, and knowledge of the species. Planning, practicing, and neat appearance will assist the exhibitor in being successful. In the Senior Swine Showmanship division: Cassidy Willis captured the rst place award with Joey Leon taking the second place award. Cassidy and Joey are members of Pig Skin Classic 4-H Club. In the Junior/Intermediate Swine Showmanship category: Rooter Runner 4-H Club member Brandon Flack was awarded the rst place award with Landon Glenn in second place. Landon is also a member of the Rooter Runner 4-H Club. Pig Skin Classic 4-H Club member Emmalee Langford was the winner of the Average Daily Gain award with Taylor Martin capturing the second place award. Taylor is a member of the Double H Livestock 4-H Club. In the Junior Herdsman division: Augustus Dunaway was awarded the rst place award with Gwen Ash in close second. Augustus and Gwen are members of the Feld a Community Pioneers 4-H Club. In the Senior Herdsman division: LaBelle High School FFA member Shelby French took the rst place award with Derek Rose in second place. Derek is a member of the Pig Skin Classic 4-H Club. Congratulations to all of the exhibitors; thank you sponsors, committee members, club leaders, advisors, and parents. The Double H Livestock 4-H Club is led by Colette Willis, the Felda Community Pioneers 4-H Club is led by Jesse & Stephanie Dunaway, the Hogs R Us 4-H Club is under the direction of Nicole Talley, the Rooter Runner 4-H Club is led by Carman Corbitt & Jessic a Grif n, and the Pig Skin Classic 4-H Club is under the direction of Jennifer Hood. The LaBelle High School FFA Advisor is Jeff Burton. Submitted By: Sonja Crawfor d Submitted photos/ Jerri Lynn MerrittGrand Champion Swine was shown by Brilee Cochran of the Pig Skin Classic 4-H Club. Brilees hog weighed 289 pounds. Submitted photo/ Jerri Lynn Merritdivision: Cassidy Willis captured the rst place Senior Swine Showmanship award and Joey Leon took second place. Cassidy and Joey are members of Pig Skin Classic 4-H Club. Submitted photo/ Jerri Lynn MerrittTaylor Martin of the Double H Livestock 4-H Club exhibited the Reserve Champion Hog, weighing in at 299 pounds. Submitted photo/ Jerri Lynn MerrittPet ShowFrom left: Alyssa Jedrykowski (Cutest Pet), Dalton Watson (Happiest Pet), Zachary Dalrymple (Most Unusual Pet), Justin Michelsen (Best Pet Trick), Cassie and Karly Hendry (Most Look Alike, Child & Pet), Ashlyn Hood and Vivianna Rodriquez (Most Unusual Name of Pet) and Katie Rose (Best Dressed Pet). Monetary donations and animal shelter supply donations collected from this event were donated to Caloosa Humane Society. New shoes, old shoes, Any kind of shoes that you no longer wear Well take them, well repair them To look like new again And ship them off to countries where shoes are very rare! *See pictures online Drop off at WORLD CLASS BARBER, 216 S Main St Ste 3 Labelle DRIVERS: $5,000 Sign-On Bonus! Great Pay! Consistent Freight, Great Miles on this Regional Account. Werner Enterprises: 1-855-517-2488 DRIVER WANTED Semi Tractor Trailer, Dump & Cement tanker experience. 863-674-1011 M-F 7 a.m. to 4 p.m. HEAVY EQUIPMENT MECHANICAL SKILLSUS Sugar is seeking candidates for Mechanical Heavy Equipment Positions Understand shop manuals, wiring diagrams, hydraulic schematics, and parts books  Basic operating knowledge of scanners, multimeters, ow meters, etc. Perform basic engine, transmission, drive train, brakes, chassis, diagnosis and repairs on cane harvesting and industrial equipment including but not limited to cane elevators, harvesters, tractors, air compressors, and other support equipment Basic conceptual knowledge of how to safely inspect, maintain, diagnose/troubleshoot, install and repair either in part or in whole equipment such as engines, fuel systems, hydraulic systems, electrical systems, pneumatic systems, cooling systems, A/C systems, transmissions (including manual, automatic, powershift, in nitely variable, constantly variable, etc. ), hydrostatic systems, gear boxes, pumps, conveyors, fans, valves, nal drives, tracks, etc. Basic conceptual understanding of electronic engine management controls (including fuel, air, exhaust, emissions, etc), electronic transmission controls, electronic hydraulic controls, electronic HVAC controls, GPS and RTK guidance systems, etc. EMAIL: Jdooley@ussugar.com OR Apply Online at www.ussugar.com Small North Carolina Winery needs vineyard hand. Must have drivers license, transportation and farm experience. Family housing available. Habla espanol 828-389-8466 PLUMBERS HELPER NEEDED. EXPERIENCE HELPFUL. CALL 863-675-1155 FOR AN INTERVIEW. FIELD TECHNICIAN for the Univ. of FL/SW FL Research & Education Center, 2685 S.R. 29, Immokalee, FL. Main responsibility is assisting in the eld and greenhouse production of crops, including labor, to maintain test plots and application of pesticide. Must have a pesticide applicator license, or be able to obtain one. Duties will also include operation and maintenance of a variety of equipment. Must also hold a valid Florida Drivers License. Apply in person or call (239) 658-3420 for application form. Drug free, Equal Employment workplace. Criminal background check is required. If you love driving but also enjoy being home then join our team and be home virtually every day. Monday thru Saturday. Work operating a T.T. 53 & straight truck reefer. Combination of local Immokalee and regional OTR. Salaried position plus quarterly incentive bonus. Bene ts include paid vacation and Health Insurance. Class A CDL with minimum of 2 years recent Regional/OTR experience with clean record required. Apply in person at 306 E Main Street, Immokalee The University of Florida, South West Florida Research and Education Center, in Immokalee, FL. is seeking a Coordinator, Research Programs/Services to organize the collection of data by program staff and /or graduate students from off-site research projects involving studies of plant and soil responses to the application fertilizers. The person lling this position will be responsible for the supervision of eld plot management and evaluation of eld sites. Responsibilities will include monitoring of treatment applications, plant tissue and soil sample collection, data analyses, and maintaining research project records. Additionally, the person will be responsible for preparation of plant tissue and soil samples for elemental analysis and supervision of personnel conducting elemental analysis required as research goals demand. Development of treatments, plot plans, data summaries and data statistics are required. Position requires a Masters in Soil and Water Science, Horticulture Agronomy or a closely related eld (foreign equivalent acceptable) or a Bachelors degree in Soil and Water Science, Horticulture, Agronomy, or a closely related eld (foreign equivalent acceptable) and two years of appropriate work experience. Please apply online at https://jobs.u .edu or phone (239) 658-3420. The Carlson Memorial United Methodist Church is seeking an individual for part time staff position of Nursery worker. Requirements include high Christian values, good work ethic, good references and applicable experience. For an application and information e-mail cmumc@embarqmail.com or call (863) 675-0656 or mail resume to 310 Campbell St. LaBelle, FL. 33935 NOTICEIndependent Newspapers will never accept any advertisement that is illegal or considered fraudulent. In all cases of questionable value, such as promises of guaranteed income from work-athome programs if it sounds too good to be true, chances are that it is. If you have questions or doubts about any ad on these pages, we advise that before responding or sending money ahead of time, you chec k with the Better Business Bureau at 772-878-2010 for previous complaints. Some 800 and 900 telephone numbers may require an extra charge, as well as long distance toll costs. We will do our best to alert our reader o f these charges in the ads, but occasionally we may not be aware of the charges. Therefore, i f you call a number out o f your area, use caution. Important Information: Please read your ad carefully the first day it appears. In case of an inadvertent error, please notify us prior to the deadline listed. We will not be responsible for more than 1 incorrect insertion, or for more than the extent of the ad rendered valueless by such errors. Advertiser assumes responsibility for all statements, names and content of an ad, and assumes responsibility for any claims against the INI USA. All advertising is subject to publishers approval. The publisher reserves the right to accept or reject any or all copy, and to insert above the copy the word advertisement. All ads accepted are subject to credit approval. All ads must conform to INI USA style and are restricted to their proper classifications. Some classified categories require advance payment. These classifications are denoted with an asterisk *. Special Notice Employment Full Time Employment Full Time Employment Full Time Employment Full Time Employment Full Time Employment Full Time Employment Full Time Employment Full Time Employment Full Time Employment Part Time Business Opportunities Reading a newspaper helps you understand the world around you. No wonder newspaper readers are more successful people! How do you find a job in todays competitive market? In the employment section of the classifieds Buying a car? Look in the classifieds. Selling a car? Look in the classifieds. Looking for a place to hang your hat? Look no further than the classifieds. 11 Caloosa Belle March 13, 2014 Looking for a place to hang your hat? Look no further than the classifieds. Reading a newspaper helps you get more out of life.No wonder newspaper readers have more fun! Handyman special. Labelle Doublewide 3/2 split oorplan steps from the Caloosahatchee River off CR 78 approximately 1 mile to the free public boat ramp. 700 Magnolia Ave. $45,000 or best offer for more information call Regina 863-517-0977. More than a handyman special. Labelle single wide with Caloosahatchee River view. Approximately 1 mile to the free public boat ramp. Remodeling started. New front deck, plywood oors,windows, doors, and stud walls. Needs your completion. 674 Magnolia Ave. $36,000 or best offer. For more information call Regina 863-517-0977. FLEETWOOD WILDERNESS, 26, new ooring & tires, nice shape, $2200/neg. Call 239-225-5442 Wanted all Travel Trailers, Motor Homes and Fifth Wheels. Any Condition, Cash paid on the spot. Call 941-347-7171 NOTICE OF MEETING OF THE SUPERVISORS OF GERBER GROVES WATER CONTROL DISTRICT NOTICE IS HEREBY GIVEN THAT THE GERBER GROVES WATER CONTROL DISTRICT, A DRAINAGE AND WATER CONTROL DISTRICT GOVERNED BY CHAPTER 298, FLORIDA STATUTES, WILL HOLD A MEETING OF THE SUPERVISORS ON WEDNESDAY, MARCH 26, 2014, AT 10:30 A.M., OR AS SOON THEREAFTER AS POSSIBLE, AT THE DALLAS B. TOWNSEND AGRICULTURAL CENTER, 1085 PRATT BOULEVARD, LABELLE, FLORIDA 33935. THE PURPOSE OF THE MEETING IS TO ELECT OFFICERS FOR THE BOARD OF SUPERVISORS AND TO TAKE ALL OTHER ACTION THAT MAY BE APPROPRIATE. ANYONE WISHING TO APPEAL ANY ACTION TAKEN AT THE ABOVE REFERENCED MEETING IS RESPONSIBLE TO HAVE A VERBATIM RECORD MADE, WHICH RECORD INCLUDES THE TESTIMONY AND EVIDENCE UPON WHICH THE APPEAL IS TO BE BASED. IF AN INDIVIDUAL REQUIRES SPECIAL AID OR SERVICES AS ADDRESSED IN THE AMERICANS WITH DISABILITIES ACT (ADA), PLEASE CONTACT CHRIS SOUD AT (863) 675-3903. 463060 CN/CB 3/13/2014 MOWING BID Barron Water Control District is accepting SEALED bid proposals up to 2:00 P.M., Thursday, March 27, 2014, at the District of ce, 3293 Dellwood Terrace, LaBelle, FL for mowing canal rights-of-way. A copy of the Instructions and Bid Documents can be obtained from the District of ce located at 3293 Dellwood Terrace, LaBelle, Florida 33935 (for pick up), PO Box 1606, LaBelle, FL 33975-1606 (mailing address) or by calling 863-675-0346. This solicitation does not commit the District to award any contracts, to pay any costs incurred in the preparation of a response to this Bid or to contract for any services. The District reserves the right to reject any or all submittals received as a result of this solicitation or to cancel in part or in its entirety this Bid if it is in the best interest of the District. Barron Water Control District is an Equal Opportunity Employer and Drug/Smoke Free Workplace. Mark Colbert, Chairman Board of Supervisors 462993 CN 3/6,13,20/2014 NOTICE OF ANNUAL MEETING OF THE LANDOWNERS OF DISSTON ISLAND CONSERVANCY DISTRICT Notice is hereby given that pursuant to call of the Board of Supervisors of Disston Island Conservancy District, and in accordance with Chapter 298, Florida Statutes 1941, and law amendatory thereto, the Annual Meeting of the Landowners of Disston Island Conservancy District for the year 2013, will be held at United States Sugar Corporation, Molasses Sales Of ce, 1995 West Hwy 27, Clewiston, Florida on Tuesday, March 25, 2014 at 11:00 A.M., for the purpose of: 1. Electing one (1) Supervisor for a term of three (3) years. 2. Receiving annual reports and taking such action with respect thereto as the landowners may determine. 3. Transacting such other business as may properly come before the meeting. BOARD OF SUPERVISORS DISSTON ISLAND CONSERVANCY DISTRICT BY: Sam Williams, President 463470 CN/GCD 3/13,20/2014 DEPARTMENT OF HOMELAND SECURITY FEDERAL EMERGENCY MANAGEMENT AGENCY Proposed Flood Hazard Determinations for Hendry County, Florida and Incorporated Areas The Department of Homeland Securitys Federal Emergency Management Agency has issued a preliminary Flood Insurance Rate Map (FIRM) and Flood Insurance Study (FIS) report, re ecting proposed ood hazard determinations within Hendry County, Florida and Incorporated Areas. These ood hazard determinations may include the addition or modi cation of Base Flood Elevations (BFEs), base ood depths, Special Flood Hazard Area boundaries or zone designations, or the regulatory oodway. Technical information or comments are solicited on the proposed ood hazard determinations shown on the preliminary FIS report and/or FIRM for Hendry County, Florida and Incorporated Areas. These ood hazard determinations are the basis for the oodplain management measures that your community is required to either adopt or show evidence of being already in effect in order to qualify or remain quali ed for participation in the National Flood Insurance Program. However, before these determinations are effective for oodplain management purposes, you will be provided an opportunity to appeal the proposed information. For information on the statutory 90 day period provided for appeals, as well as a complete listing of the communities affected and the locations where copies of the FIRM are available for review, please visit FEMAs website at http://www.fema.gov/plan/prevent/fhm/bfe, or call the FEMA Map Information eXchange (FMIX) toll free at 1-877-FEMA MAP (1-877-336-2627). 463384 CN/CB3/13,20/2014 NOTICE OF APPLICATION FOR TAX DEED Chapter 197.512 Florida Statutes NOTICE IS HEREBY GIVEN THAT the US Ameribank % Kingery/Crouse Magnolia TC2 SA LLC the holder of the following certi cate has led said certi cate for a tax deed to be issued thereon. The certi cate number, year of issuance, description of property and the name in which it was assessed are as follows: CERT. NAME IN NO. YEAR DESCRIPTION WHICH ASSESSED 4239 2010 4104329-04021650020 James V Pridgen Lot 2, Block 2165, PORT LABELLE UNIT 4, according to the plat thereof recorded in Plat Book 3, Page 86, Public Records of Hendry County, Florida. Less and except Gas, Oil and Mineral rights not owned by prior owner. Subject to existing easements and right of ways of record. All of said property being in the County of Hendry, State of Florida. Unless such certi cate shall be redeemed according to law, the property described in such certi cate will be sold to the highest bidder at www.hendry.realforeclose.com at 11:00 A.M. on the Second Thursday in the month of April, 2014, which is the 10th day of April, 2014. Dated this 26th day of February, 2014. Barbara S. Butler Clerk of Circuit Court Hendry County, Florida 463085 CN 3/6,13,20,27/2014 NOTICE OF APPLICATION FOR TAX DEED Chapter 197.512 Florida Statutes NOTICE IS HEREBY GIVEN THAT the US Ameribank % Kingery/Crouse Magnolia TC2 SA LLC, the holder of the following certi cate has led said certi cate for a tax deed to be issued thereon. The certi cate number, year of issuance, description of property and the name in which it was assessed are as follows: CERT. NAME IN NO. YEAR DESCRIPTION WHICH ASSESSED 4244 2010 4104329-04021690100 David Scott Washburn Lot 10, Block 2169, PORT LABELLE UNIT 4, according to the plat thereof recorded in Plat Book 3, Page 86, Public Records of Hendry County, Florida. Less and except Gas, Oil and Mineral rights not owned by prior owner. Subject to existing easements and right of ways of record. All of said property being in the County of Hendry, State of Florida. Unless such certi cate shall be redeemed according to law, the property described in such certi cate will be sold to the highest bidder at www.hendry.realforeclose.com at 11:00 A.M. on the Second Thursday in the month of April, 2014, which is the 10th day of April, 2014. Dated this 26th day of February, 2014. Barbara S. Butler Clerk of Circuit Court Hendry County, Florida 463075 CN 3/6,13,20,27/2014 NOTICE OF APPLICATION FOR TAX DEED Chapter 197.512 Florida StatutesNOTICE IS HEREBY GIVEN THAT the US Bank as C/F FL Dundee Lien Inv, LLC the holder of the following certi cate has led said certi cate for a tax deed to be issued thereon. The certi cate number, year of issuance, description of property and the name in which it was assessed are as follows:CERT. NAME IN NO. YEAR DESCRIPTION WHICH ASSESSED 879 2010 1274329-01000E20340 Juan Esquivel THE WEST ONE-HALF OF THE FOLLOWING DESCRIBED PROPERTY: From the intersection of the South line of Section 4, Township 44 South, Range 29 East, Hendry County, Florida, with the centerline of SR 29, run N 03 degrees 51 W, along the centerline of SR 29, a distance of 400 feet to the P.O.B. Thence N 86 degrees 26 E 450 feet; thence S 03 degrees 51 E 125 feet; thence S 86 degrees 26 W 450 feet; thence N 03 degrees 51 W 125 feet to the P.O.B. Less the Westerly 50 feet for the right-ofway of SR 29. More commonly known as Business Lots 34, 35, 36, 37 and 38, Section E-2, LaBelle Ranchettes, an unrecorded subdivision. Less and except Gas, Oil and Mineral rights not owned by prior owner. Subject to existing easements and right of ways of record. All of said property being in the County of Hendry, State of Florida. Unless such certi cate shall be redeemed according to law, the property described in such certi cate will be sold to the highest bidder at www.hendry.realforeclose.com at 11:00 A.M. on the Second Thursday in the month of April, 2014, which is the 10th day of April, 2014. Dated this 26th day of February, 2014. Barbara S. Butler Clerk of Circuit Court Hendry County, Florida 463084 CN 3/6,13,20,27/2014 NOTICE OF APPLICATION FOR TAX DEED Chapter 197.512 Florida Statutes NOTICE IS HEREBY GIVEN THAT the County of Hendry, the holder of the following certi cate has led said certi cate for a tax deed to be issued thereon. The certi cate number, year of issuance, description of property and the name in which it was assessed are as follows: CERT. NAME IN NO. YEAR DESCRIPTION WHICH ASSESSED 2361 2009 1314433-A0001340000 David & Yasmin K McGee The North one-half of the Southeast one-quarter of the Southwest one-quarter of the Northeast one-quarter of the Northwest one-quarter of Section 31, Township 44 South, Range 33 East, Hendry County, Florida. Subject to an easement for an access road of the East 30 feet thereof. Also known as Tract 5846, MONTURA RANCH ESTATES, an unrecorded subdivision Less and except Gas, Oil and Mineral rights not owned by prior owner. Subject to existing easements and right of ways of record. All of said property being in the County of Hendry, State of Florida. Unless such certi cate shall be redeemed according to law, the property described in such certi cate will be sold to the highest bidder at www.hendry.realforeclose.com, at 11:00 A.M. on the First Thursday in the month of April, 2014, which is the 3rd day of April, 2014. Dated this 12th day of February, 2014. Barbara S. Butler Clerk of Circuit Court Hendry County, Florida 462047 CN 2/20,27;3/6,13/2014 NOTICE OF APPLICATION FOR TAX DEED Chapter 197.512 Florida Statutes NOTICE IS HEREBY GIVEN THAT the US Ameribank % Kingery/Crouse Magnolia TC2 SA LLC, the holder of the following certi cate has led said certi cate for a tax deed to be issued thereon. The certi cate number, year of issuance, description of property and the name in which it was assessed are as follows: CERT. NAME IN NO. YEAR DESCRIPTION WHICH ASSESSED 3066 2010 1214334-01000050120 Daisy Bell Williams c/o Lois Gray Prof Bus Svc Lot 12, Block 5, HARLEM ADDITION NO. 4 TO CLEWISTON, Hendry County, Florida, according to the plat thereof, recorded in Plat Book 3, Page 32, of the Current Public Records of Hendry County, Florida. Less and except Gas, Oil and Mineral rights not owned by prior owner. Subject to existing easements and right of ways of record. All of said property being in the County of Hendry, State of Florida. Unless such certi cate shall be redeemed according to law, the property described in such certi cate will be sold to the highest bidder at www.hendry.realforeclose.com, at 11:00 A.M. on the First Thursday in the month of April, 2014, which is the 3rd day of April, 2014. Dated this 12th day of February, 2014. Barbara S. Butler Clerk of Circuit Court Hendry County, Florida 462051 CN 2/20,27;3/6,13/2014 HENDRY COUNTY NOTICE OF PUBLIC MEETING LOCATION CHANGE Members of the Board of County Commissioners of Hendry County, Florida, may attend and speak at a Community Values Workshop, at 6:00 p.m. on March 20, 2014. The location of the meeting has been changed to the Montura Clubhouse, 255 N. Hacienda St., Clewiston, Florida. All members of the public are welcome to attend. Board of County Commissioners Hendry County, Florida Karson Turner, Chairman 463365 CN/CB 3/13/2014 LABELLE 2/2 unfurnished condo, tiled oor, berber carpet, washer/dryer, kitchen appliances included. Located in Villas at River Run. $67,500. (863) 517-0162. Firewood for sale 863-599-9559 BEDROOM SET: Queen size, triple dresser w/2 mirrors, chest of drawers, night stand and headboard. $500 or best offer. (863)675-4557 LOFT BED: Full Size, complete. 1 year old. $150. (954)240-0471 SELLING OUT 200 DVD movies, factory sealed Make offer. 863-843-5289 long ring, after noon time or weekends 1 BEDROOM APT, Completely furnished. Ready to move in, near center of LaBelle. $600/mo. + sec. dep. Call 863-234-1153. 1 BR, 1 BA, Furnished apartment in LaBelle. Includes satellite TV, Washer & Dryer, C/Air. $650 mo. + electric. (239)370-8532 Greentree South Apartments Available for Immediate Occupancy 2, 3 & 4 Bedroom Apartments Ask about our move-in specials Spacious Apartment in quiet, country setting Full time bilingual Site Manager Community Room, Tot lot, Playground, Activities Sewer and trash included in rent no additional charge to resident Rental rates starting at $602 Call 675-0313 TDD #1-800-955-8771 40 Greentree Drive, #101, LaBelle 9:00 AM -5:00 PM, Mon-Fri Equal Housing Opportunity Provider & Employer 3 bedroom house (2006) with tile oors, large bedrooms. Whirlpool tub, 5 chain link fence. Quiet neighborhood. Please call Dwight 863-677-1114 LaBelle Lrg. 3 br./2ba. on corner lot. Fenced back yard. Rent normally $750 mo., reduced to $550 mo. due to exterior remodeling. 863-675-0104. LABELLE Lrg. 3BR, 2BA, 2 car gar., tiled oors, in Port LaBelle/New Section, near schools. 3069 NE Beechwood Cir. $875/mo. 1st, last, sec. 954-873-3322. RIVER FRONT: 2BR, 2.5BA, Florida Room, 2 Car Garage, Large Private Yard. Near Golf & Marina. $950 mo. + sec. & refs. Please call (970)708-9993 EXECUTIVE OFFICES 90 N. Main, North of McDonalds / Rt. # 80. Desk space $149. Private Of ces $349 up. Monthly rates include utilities, use of conference room, WIFI, Equipment, plus much more. Call owner 863-673-5071 Retired Christian lady, wants to share my large home with a person with similar interests. Nonsmoker, walking distance to churches, stores and restaurants 863-675-0866LABELLE RENT-A-SPACE Cowboy Way & Kennedy Blvd. Monthly includes tax: 5x10 $42.80; 8x10 $53.50;10x10 $58.85; 8x25 $96.30; 24 hr access $25 returnable key deposit. 863-675-2392 RENTAL PROPERTY 23 UNITS Owner Finance Call (239)300-1221 2 1/2 acres in Pioneer Plantation set up lot with well, septic, and electric. Bring your horses, kids, and 3 wheel Hondas. Zoned residential 2350 Riviera Ave. $29,000 or best offer. For more information call Regina #863-5 17-0977. 2 acres beautifully wooded between Phillips Road and Murray. 4 miles west of Labelle off highway 80. 20 miles east of Fort Myers. Zoned residential 2290 Phillips Rd. Access from Phillips Road behind 2280. Bring your horses, kids, and 3 wheel Hondas. $ 34,000 or best offer by April 1, 2014. For more information call Moses #561-305-0851 Mobile HomeSale Campers/RVs Home Sales Firewood Furniture Video/Audio Apartments Apartments Houses Rent Office Space Rent Roommate Storage Space Rent InvestmentProperty Land Sale Public Notice Public Notice Public Notice Public Notice Public Notice Public Notice Public Notice Love the earth Recycle your used items by selling them in the classifieds. Grab a bargain from your neighbors garage, attic, basement or closet in todays classifieds. How fast can your car go? It can go even faster when you sell it in the classifieds. When doing those chores is doing you in, its time to look for a helper in the classifieds. Its never too late to find the perfect gift. Look for it in the classifieds. When you want something sold, advertise in the classifieds. Join all the people who say, I sold it in the classifieds. Get a quick response to any item you may be selling with a classified ad. Your next job could be in todays classifieds. Did you look for it? Your new home could be in todays paper. Have you looked for it? Shop here first! 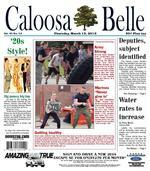 The classified ads 12 Caloosa Belle March 13, 2014 How fast can your car go? It can go even faster when you sell it in the classifieds.